I'm delighted to welcome Terri Osburn to the Dish today. Terri and I first met online about twelve years ago and in person in 2009. It's been such a joy to watch her achieve her goal of becoming a published author and I couldn't be happier for the success she's experienced. She's an auto-buy for me, not because she's a friend but because she writes contemporary romances I love to read. 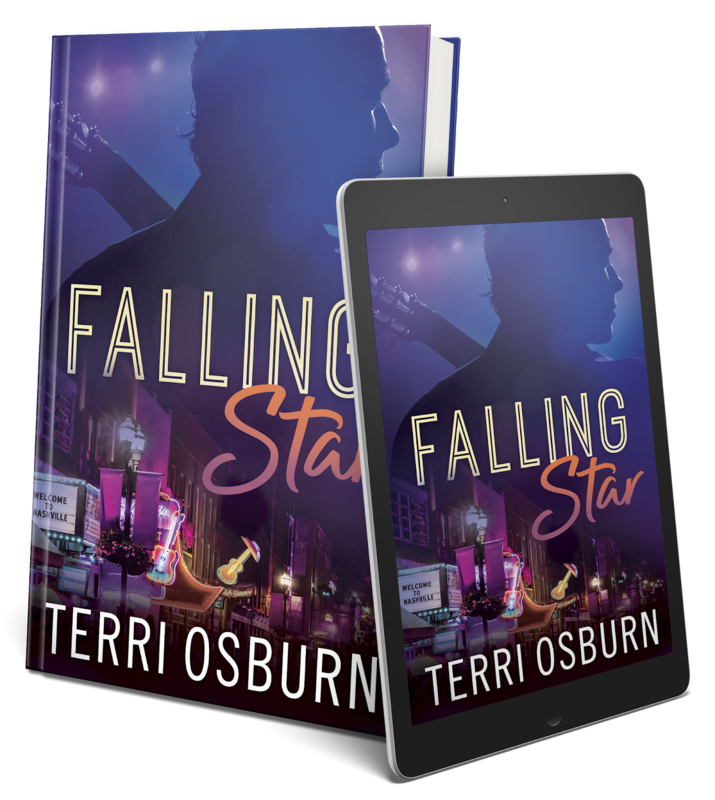 Terri joins us today to talk about her newest novel, Falling Star (read Janga's review), set in Nashville, within the country music industry. This is a world Terri knows well as she was a Country Music DJ for eight years and recently moved back to Middle Tennessee. Take it away, Terri! Hello, Dear Dishers and thank you to PJ for letting me hang with y’all today. For those who don’t know me, I’m Terri Osburn and I write contemporary romances with heart, hope, and lots of humor. I’m best known for my Anchor Island series, set on a tiny island in the Outer Banks of North Carolina, but I also have the Ardent Springs series set in small town Tennessee. With all that said, you might think it odd that I set my new Shooting Stars series in the city of Nashville, but that isn’t really odd at all. You see, if you’ve ever visited, you know that Nashville is the city that feels like a small town. (Ignoring the traffic issues, of course.) Downtown is honkytonks and high-rises, but drive fifteen minutes in any direction and you’re back in the country. And then there’s the fact that the books are set in the country music scene, which is a tiny world all its own. In the first book, RISING STAR (released Sept 2017) we met aspiring singer Dylan Monroe and Nashville’s newest radio personality Charley Layton. Their story is about young people chasing their dreams, and learning how to mesh love and ambition. 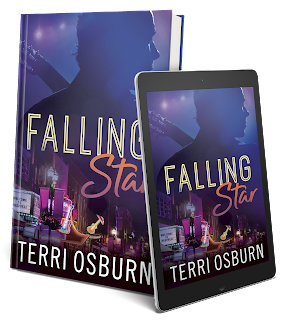 FALLING STAR (released March 2018) goes to the other end of the spectrum. Chance Colburn has been on top for more than five years. He’s ruled the charts, played to sold-out crowds, and won awards. 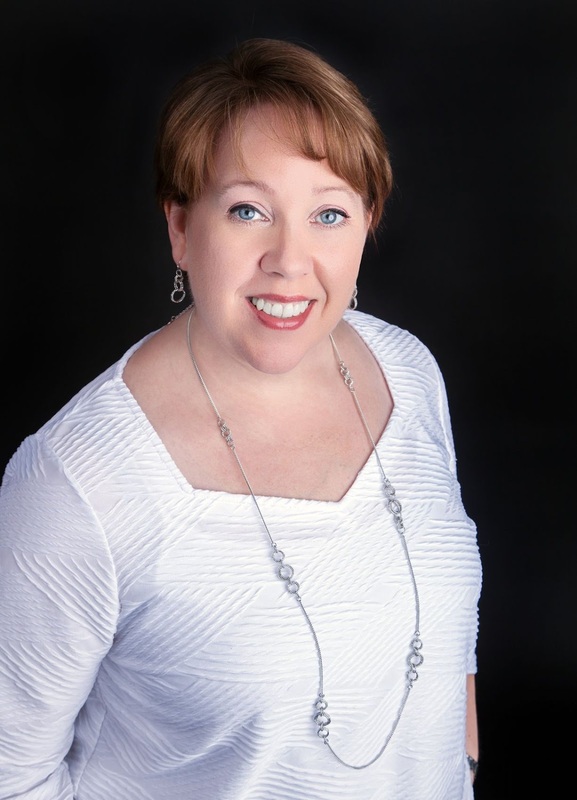 Naomi Mallard is an established publicist running the PR department of Shooting Stars Records. She’s helped successfully launch Dylan Monroe’s career and now it’s time to tackle the task of redeeming a man who once broke her heart. I’ve made a habit, consciously at times, of writing second chance stories, but this one goes a step farther, venturing into redemption and forgiveness. We often see celebrities make headlines for going off the rails or stumbling into trouble, and the world-at-large passes judgment. But the truth is, we don’t know these people. We have no idea what has made them who they are, or know the battles they’re fighting in their own minds. There is rarely justice in the court of public opinion, and FALLING STAR explores what it might be like to be the individual on trial. Chance owns up to his sins and failings with no illusions about being forgiven. In the end, he’s a man trying to do better. To learn how to make music without the help of Jack Daniels, and win back the love of the only woman who ever really saw any good in him. If he can do that, he might even learn to forgive himself, which is all that really matters. Here’s an excerpt that shows where Naomi and Chance are at the start of the story. Annoyed by the sarcasm, Naomi replied, “Screw you,” and imme­diately regretted saying something so horrible to a stranger. But when she looked up to apologize, the person she found was no stranger. Before she could reply, Chance strolled back into the small ball­room, and it was all she could do not to scream at his back. He’d slept with her boss as a favor? Really? I can be both fascinated and appalled by celebrity behavior. I think many celebrities are just like us and try to lead normal lives, but then there are those who daily seek attention (example- the Kardashians). I have been looking forward to reading Falling Star. I have read every book you have published thus far. I don't think they should be held to a higher standard but don't whine about unwanted attention when you chose to pursue a profession that's all about gaining attention. That bit does tend to send me over the edge. I do, however, exempt the children of stars from that attention bit (I think they should be allowed their anonymity) unless, of course, you shove them into the spotlight yourself. I think there is a difference in the public interest that has long been a side effect of fame and the obsession with celebrities and the hounding of them that is prevalent today. Like PJ, I have little sympathy for the star who accepts his/her privileges, including exorbitant salaries, but complains about loss of privacy. On the other hand, I am sickened by the strength of the public's buzzard instinct when a celebrity has to deal with death, divorce, or some other devastation. I'm loving the Nashville series, Terri. I'm already looking forward to the next one. I'm especially eager to see how you make someone guilty of that level of betrayal into a hero. I think the public buzzard instinct is out of control and not only as it pertains to celebrities. Too many people seem to delight in seeing others brought low. Let's see if a change of browser will make this work. Testing?? PJ, thank you so much for letting me hang here today. And working so hard to help me being able to comment. I'm with you on Hugh and the kids issue. But simply taking your kids to school in the morning is not the same as "putting them out there" and I dislike that some paparazzi argue that it is. Leave them alone! Janga, I'm eager to see how I pulled that off as well. lol Though I can say that his book is still a couple away so maybe I'll figure it out by then. Celebrities really are publicly dissected and so little of what gets reported is even close to the truth. I'm not sure deciding to be, say, an actor is the same as deciding you want to be famous. It's a job like any other, and there's no way to know when you're deciding on your life path if you'll someday be a Meryl or Leo. I totally agree with you on the kids. They should be able to lead normal lives without the fear of being stalked by paparazzi. Being famous is not a choice they made. Terri, have you decided how many books will be in the Shooting Stars series? Hey Terri! How are you?! Lots of changes for you since the last time we caught up - super success with your writing (loved Anchor Island and Ardent Springs) and a big move back to TN! So excited about this new series. I really like stories about celebrities/rock stars. I think I'm with the popular opinion here - don't like the whiners, but when all is said and done they are all still human beings trying to live their lives just like the rest of us. And to tell the truth I think it's harder for them to find true, lasting love cause the circle of people they can trust gets smaller and smaller the more famous they get. And it's also easier for their lives to spin out of control if they have other issues that they are dealing with - which is what I'm assuming this story is about. That is exactly what this book is about. Chance looks like a guy who has it all who can't keep his head out of the bottle, but there's so much more going way back to his early childhood. Let's say he hides the scars well, but they drive him toward trouble at the same time. Definitely let me know if you are heading up this way! It would be great to meet up. I'm sad we never did make it out to Williamsburg while you were in the vicinity! Hubby is talking retirement, though, and getting out of the cold! My sister has been trying forever to get us to consider Tennessee! I have met some some celebrities who are nice, and I've been treated rudely by others. Was it a bad day or just the personality? Who knows? Some feel entitled, some have been hounded, some are jerks, and some are nice but have learned to keep people at an arm's length. It's too easy to judge in a fleeting moment. But we do so love to judge. I'm more annoyed by the people who go on these crazy reality shows looking for fame, and then get famous for being mean or bossy or giving a ring to a virtual stranger. Seriously. WHY would anyone do that? I think judging - whether celebrities or just plain folk - has become a sport for many people. I also think that as it has been said before, if you are gonna take the huge bucks for being a celebrity, don't be surprised if you lose privacy. And if you are gonna tell everyone every thing about yourself, don't be surprised if the public does not turn away when you want them to turn away. At the same time, for heaven's sake, we need to get our own lives and quit prying into someone else's life because they have good hair and an agent that got them a break. If there were not people who want to know way too much about others, there would be no paparazzi, no People magazine and no way too many tv shows which pry into private lives. I am stepping off my teeny tiny soap box now. That's exactly what I keep saying. If no one was buying those trashy magazines at the grocery counter, they couldn't pay top dollar for paparazzi pictures and wouldn't be in business. I wish they'd replace those mags with something society could really use. I already have the book, so don't enter me. I feel sorry for most of the celebrities, especially if a marriage breaks up and it's all over the magazines & internet. It is still sad and heartbreaking and no one's business but their own. However, I do think that being in the public eye, and sometimes being a role model, should motivate them not to be mean or act like a jerk. I especially feel bad for kids growing up in the business. My high school and college years were about dating, experimenting, making mistakes, and finding myself and my direction in life. I cannot imagine how difficult that would have been under the spotlight of the paparazzi and everybody's "need to know." It's no wonder so many of them end up screwed up. You and me both, PJ! I always say I wouldn't mind being rich but you can keep the famous! If I wasn't screwed up at the outset I would be after every stupid decision I made in my life was broadcast to the whole world! Going through divorce is bad enough. Going through it with the whole world speculating and passing judgment must be unbearable. When I worked in radio in a small town I experienced a tiny inkling of fame. That was more than enough to know I never want to be truly famous. .I cannot I being a celebrity at all. I would hate being followed around all the time and having people follow you everywhere and not having privacy. I hate the shows feel like they have to keep repeating their problems day after day after day. Isn't there anything else to report? Some of them love the attention so much that I think they don't know what reality is (the K family) to spend thousands on a childs purse is so wasteful IMO. These children will never know reality and what things cost or what an average person makes. Others try their best to raise their kids to be normal. No sense of reality is a big problem. We all want more for our children than we had, but as you point out, many of these celebrities (I use the term loosely in the K family case) are setting these poor kids up for trouble if the illusion ever ends. I believe some people looking for fame, don't understand the price you have to pay. They just see it as a way out. Ultimately fame makes for constant recognition. It does not allow to you to be just a normal person. Honestly, I think it depends on the celebrity. There are plenty of 'regular' people mixed in with the attention seekers. Logically, I know they are people like us but there are some who are just a tad interesting. Of course there are also those who are attention whores, doing what they can to make sure people notice them. I really dislike the way the paparazzi stalk and go after celebreties - even distort the truth about them. I do believe that many are decent individuals like you and me. Terri, thanks so much for visiting with us today and instigating such an interesting discussion. Hollywood has become too political. I watch a movie to be entertained. I don't want to know what the actor's view is on gun control, abortion, immigration, etc. It seems like that's all you get any more is some celebrity using their status to bend our thinking to theirs. If that's what they want to do then run for office. Otherwise, keep a sock on it. I've been watching old movies lately which are far better than the trash they are putting out today.